Monday night about 8 o’clock Pearl Akers died of consumption. Some six years ago he was married to Miss Stella McCreary. He is survived by a wife, two children and a number of other relatives. He was a member of the Wylie lodge of the Fraternal Union of America. He was a son of A. Akers, a prominent citizen and good man of the Lucas community. 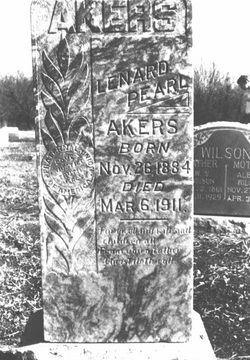 Lenard Pearl Akers, buried in the Murphy Cemetery.